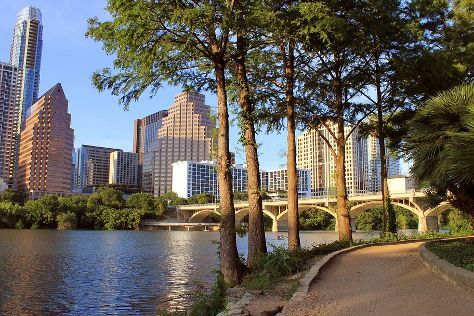 Start off your visit on the 4th (Thu): trek along Lady Bird Lake Hike-and-Bike Trail, then ponder the world of politics at Texas State Capitol, and then contemplate the long history of The Driskill. Here are some ideas for day two: take an in-depth tour of LBJ Presidential Library, then take some stellar pictures from Mount Bonnell, then witness a stunning natural landmark at Barton Springs Pool, and finally identify plant and animal life at Congress Avenue Bridge / Austin Bats. To find more things to do, traveler tips, where to stay, and more tourist information, read our Austin day trip website . If you are flying in from United States, the closest major airports are Austin Bergstrom International Airport and San Antonio International Airport. Expect a daytime high around 85°F in October, and nighttime lows around 62°F. Finish your sightseeing early on the 6th (Sat) to allow enough time to travel to Paris. Take a break from Paris with a short trip to Palace of Versailles in Versailles, about 48 minutes away. There's lots more to do: examine the collection at Musee d'Orsay, take in the spiritual surroundings of Cathédrale Notre-Dame de Paris, admire the landmark architecture of Sainte-Chapelle, and contemplate the long history of Basilica du Sacre-Coeur de Montmartre. For traveler tips, photos, ratings, and more tourist information, go to the Paris trip itinerary planner. Traveling by flight from Austin to Paris takes 15 hours. Alternatively, you can do a combination of bus and flight. Traveling from Austin to Paris, you'll lose 7 hours due to the time zone difference. Traveling from Austin in October, expect nights in Paris to be a bit cooler, around 48°F, while days are much colder, around 62°F. Finish your sightseeing early on the 10th (Wed) so you can travel to Aix-en-Provence. You'll discover tucked-away gems like Carrieres de Lumieres and Chateau des Baux de Provence. Venture out of the city with trips to Arenes de Nimes (in Nimes), Amphitheatre (les Arenes) (in Arles) and Pont du Gard (in Vers-Pont-du-Gard). And it doesn't end there: explore the striking landscape at Calanques, admire the masterpieces at Museum of European and Mediterranean Civilisations, and wander the streets of Cours Mirabeau. 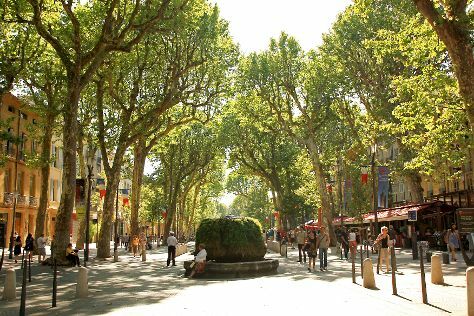 To see reviews, photos, traveler tips, and more tourist information, you can read our Aix-en-Provence online trip planner . You can do a combination of flight and bus from Paris to Aix-en-Provence in 3.5 hours. Other options are to do a combination of train and bus; or drive. In October, Aix-en-Provence is a bit warmer than Paris - with highs of 72°F and lows of 55°F. You will leave for Ravello on the 14th (Sun). Ravello is a town and comune situated above the Amalfi Coast in the province of Salerno, Campania, southern Italy, with approximately 2,500 inhabitants. Eschew the tourist crowds and head to Duomo di Sant'Andrea and Villa Cimbrone Gardens. Change things up with these side-trips from Ravello: Fornillo (in Positano) and I Suoni degli Dei - Pelagos (in Praiano). Dedicate the 15th (Mon) to wine at some of the top wineries in the area. And it doesn't end there: take in the spiritual surroundings of Duomo di Ravello, get a taste of the local shopping with Ceramiche d'Arte Carmela, pause for some serene contemplation at Chiostro del Paradiso, and admire the landmark architecture of Villa Rufolo. For reviews, traveler tips, ratings, and more tourist information, read Ravello journey maker site . You can do a combination of bus, flight, and train from Aix-en-Provence to Ravello in 8.5 hours. Alternatively, you can do a combination of bus, flight, and train; or drive. Traveling from Aix-en-Provence in October, Ravello is somewhat warmer at night with lows of 63°F. Finish up your sightseeing early on the 17th (Wed) so you can travel back home.